With World Cup football fever gripping the country, a cricket match at the origin of (daily) time provided a serious selection challenge for Steve Hamilton. With eight Fallopians eventually making it to Greenwich Park, a green wicket encouraged me to bowl first. Cincinatti, managing only nine players, put on a steady start. Despite the green wicket, there was little swing or seam. Syeed's left arm medium pace bowled the first batsman and brought Cincinatti skipper Brendan to the crease. Kem bowled consistently and was unlucky to take just the one wicket. The star was OF leggie Mohit, who combined control with artistry - beautiful leg spinners mixed with unreadable googlies. He took two wickets and with Steve and John providing good support, Cincinatti were bowled out for 214 from 35 overs. Our run chase started auspiciously with a second consecutive 40 plus opening stand, ended by Vish being bowled by a low turner. Mohit, having bowled superbly, now oozed class and style with the bat, comprising wristy drives and deft cuts. He was ably supported by Kem and at 90-1 we were cruising. Then Kem lost his balance and was out stumped. Myself and Mohit continued the good work and runs were easy to come by due to a sun-scorched lightening outfield. Three balls before a drinks break, a visibly irritated Cincinatti could not believe their good fortune. Mohit hit Cincinatti chairman and off spinner Tim straight down cow corner's throat. Next ball I planted my foot three feet outside the crease only to be given LBW by Kem. 98-2 became 120 all out. A stunning performance from Tim of Cincinatti: five wickets and a 50. However, the evening only improved as John, Steve and I trampled across Blackheath in the dusky haze to join Cincinatti at 'The Hare and Billet'. 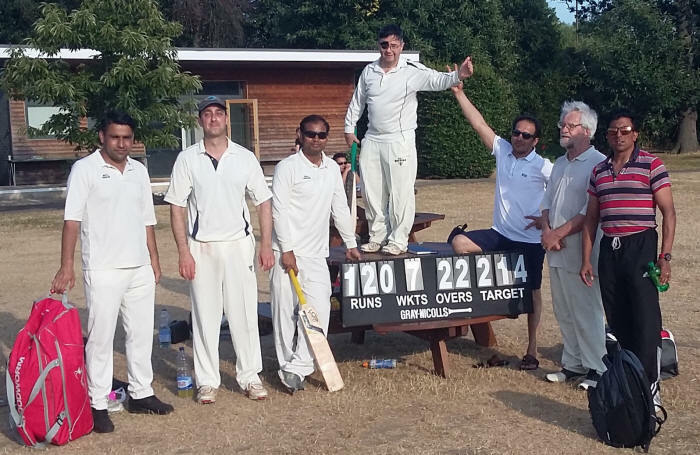 The conversation swung between LBW laws, future combined cricket tours and ... Brexit. A splendid day ... come on England, bring it home!